Bankrupt Blockbuster Spending Millions on National Ad Campaign Bashing Netflix … Again? 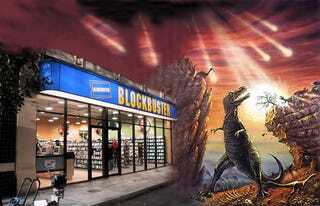 Recently bankrupted Blockbuster is jumping back in the game with a $15 to $20 million TV ad campaign. Reuters reports that Blockbuster is once again trying to raise awareness that it has new releases 28 days before Netflix and Redbox. But wait, wait! Haven't we heard this before? "How often does a company get a material, tangible point of differentiation?" Keyes told Fast Company in June. "What would you recommend? Should we just sit and be quiet about this 28-day advantage?" Apart from the obvious—that Blockbuster has already tried this business model and failed—Blockbuster's competitor Netflix is far from worried by this four week leg-up. Rather, unlike how Keyes' has framed its deals, Netflix has actually invited the 28-day delay from studios. "We actually went proactively to the studios several years ago because the 28-day model is really good for us—we recommended it," Steve Swasey, VP of corporate communications for Netflix, told us soon after our discussion with Keyes. He explained that the agreement shaved off significant costs, enabling the online-subscription company to provide its customers with better availability and more titles to stream instantly. "We're even talking to other studios about it as well," he said. Regardless, Blockbuster still thinks it's primed for a comeback, just as Apple was in the late 1990s. "Think about Apple 10 years ago—Steve Jobs came back and did a masterful job," Keyes once said. "I don't know if you recall, but there were questions about the long-term viability of that company, and look at the success that they have today." The difference is that when Steve Jobs returned he didn't reintroduce the Newton. He built the iMac. He made the iPod, the iPhone, and iPad. Imagine if Apple's solution was to just run a national TV ad campaign touting Apple's line of cameras and printers? But in all fairness, Blockbuster has yet to advertise the 28-day advantage. In an earnings call before its bankruptcy, Blockbuster said the company had not had the liquidity for an aggressive advertisement campaign, and that traction with consumers would remain "choppy" for some time. So maybe it'll work this time!